The Junior League of San Antonio just celebrated its 7th annual ¡VIVA! SA Race. The ¡VIVA! SA Race is an annual 5K and 10K run downtown that starts in the beautiful Hemisfair Park. This family-friendly event is one of the League’s annual fundraising events, and the proceeds help support the League’s mission and multiple community endeavors. The 2019 race featured a group of very special first-time participants–the girls from ¡Vámonos! ¡Vámonos! 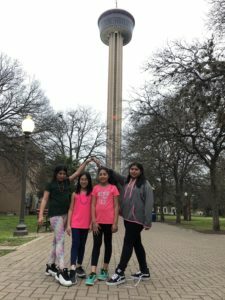 is a Community Placement that partners with Girls Inc. and Hemisfair Park to help mentor and train 3rd – 5th grade girls. The girls have been meeting with League members at Hemisfair Park on Thursdays at 5:30 p.m. since September to train for the ¡VIVA! SA Race. For many of the girls this is the first time they have ever trained for a race like ¡VIVA!, so it is a wonderful opportunity for the girls to learn how strong and capable they are. Volunteers take turns planning and leading the weekly training, which keeps things fun and interesting and gives them a chance to sharpen their leadership skills. “This placement is a great way to become a mentor to young girls. You see the same group of girls every week, so you are really able to connect and develop a positive relationship with them. They have varying levels of ability, so you have an opportunity to see them grow and change through the year with your help,” said Anne Chilton, ¡Vámonos! Chair. Volunteers do not need to have prior running or training experience and are not required to register for the race, but should be able to attend the race in the spring. “We also have some volunteers who are not ‘runners,’ so it is a fun way to stay active and challenge yourself as well,” said Chilton. If you are a JLSA member interested in learning more about ¡Vámonos!, please contact the Community Placement Advisor.